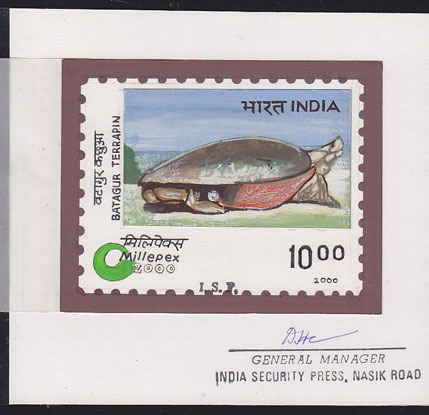 9166 MAQ INDIA (2000) Batagur Terrapin*. Original artwork for Millepex 2000 issue. Watercolor on heavy paper, signed by General Manager of India Security Press. Design measures 9 x 7 cm. Scott No 1802. Accepted design, but the value was changed. 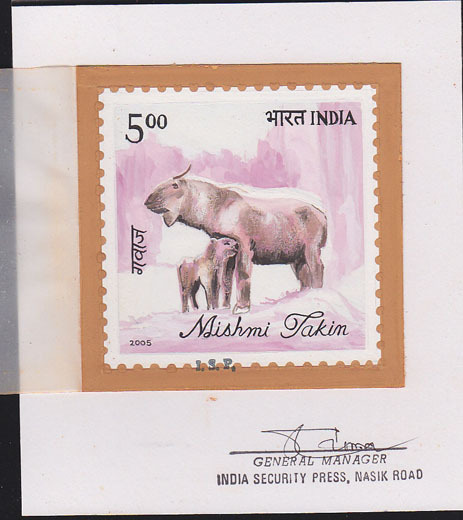 9182 MAQ INDIA (2005) Mishmi takin*. Original artwork for Flora & Fauna issue. Watercolor on heavy paper, signed by General Manager of India Security Press. Accepted design measures 9 x 9 cm. Scott No 2101c. The mishmi takin is an endangered goat-antelope. Unique!